Engagements | CCS Consulting, Inc. Using her narrative-based approach, Chris Cavanaugh-Simmons continues to reshape the executive landscape in a variety of ways. The University of Alberta’s Gold College uses Cavanaugh-Simmons’ book, Three Stories Leaders Tell: The WHAT and WAY of Using Stories to Lead, to help high-level academics develop the values-based leadership skills to change the leadership culture within the university and beyond. Cavanaugh-Simmons helped develop The Advocacy Program, or TAP, bridging the disparate experiences of senior executives and executive candidates of color at Brown-Forman Corp. and helping them together create a new company story. Through the use of story and personal narrative, Cavanaugh-Simmons is helping the nation’s top scientists at the Sandia National Laboratories unearth and use their leadership skills to address the nation’s security challenges and reach their mission. Working with key executives and leaders at the top of Salesforce.com, Cavanaugh-Simmons guides them in writing personal, team, and organizational narratives, while also providing coaching on how to influence in a flat and highly collaborative environment. 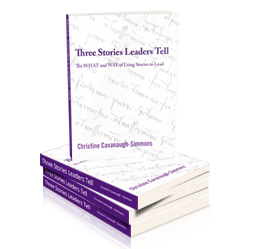 Resources for all those called to leadership who understand the power of words and stories to shape their futures from one of the nation’s preeminent narrative coaches, Christine Cavanaugh-Simmons of CCS Consulting Inc.
© 2019 CCS Consulting, Inc. All Rights Reserved.